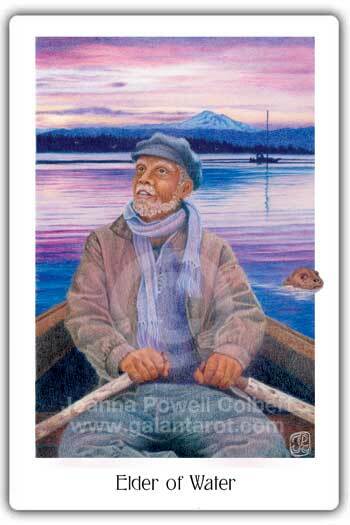 Today's Draw: The Elder of Water from the Gaian Tarot by Joanna Powell Colbert. Do you talk to strangers when you're out and about? Or do you just stand quietly in the grocery store line, possibly even checking your phone? How often in your daily life do you find opportunities to serve? There's a special brand of stillness that comes at dawn and dusk. At dusk, the water will calm and all the day's noisy little critters will quieten and settle in their nests. At dawn, you find the world in the depths of its repose, just about to slowly awaken and get about the day's business. There exists a similar place inside of you that you can access anytime through meditation and practice. Sitting in silence at those liminal times of the day and attuning yourself to the vibe of nature can help you build that muscle. So many of us forget the importance of injecting peace and stillness into our days. Some may not even know how. It doesn't happen when you're watching TV or knitting, though you can enter a trance-like state doing anything. But true peace and stillness goes beyond a trance-like state. It comes from stilling our body, mind and emotions and just...being. There in the midst of all the nothing is where peace is found. I've talked about meditation here a million times. I'm not going to talk about it today. But I mention it because if we manage to find a way to reset ourselves every day...to clear the galleys and go to that holy place inside us...we're in a better position to do what we've come here to do—serve. I think we've forgotten that. We have so much on our minds just trying to serve the demands of daily life...job, family, logistics. Of course, we're serving others when we do our work or take care of our family. But that's not just what I'm talking about. Nor am I talking about putting a check into an envelope, though that is service, too. What I'm talking about is more of a lifestyle of realizing that common kindnesses and thoughtful discourse can make a huge impression on someone. Of course, so can something more active like volunteering at a local charity. But what I'm really getting at is making a concerted effort to realize that any moment in our lives can change the life of another in some positive way. And I believe we're in a better position to do that if we're able to return back to source at some time each day and remember the special beings we are and have come here to be. We have no way of knowing when a smile or a kind word of ours will hit someone at a critical moment. I was recently talking to someone about the experiences we had in our lives that made a huge impact on us, but the other person didn't even remember saying it. You've all experienced something like that. Just the act of engaging another person holds so much potential for service. It's not like I'm thinking we all walk around like sad sacks all the time. But I do believe we all walk around "unconscious" much of the time. Distracted by thoughts of what needs to be done. Or with our head buried in an electronic device. Or too shy to tell the woman in front of you that you like her scarf. These are the moments I'm talking about...the moments that are ripe for potential for service. They don't take any extra time out your day. You were going to open the door anyway, why not hold it open for someone? You're standing in line anyway, why not compliment the person in front of you? You were walking down the street anyway, why not make eye contact with someone and smile? Sometimes you'll be awkward. Sometimes the person will look at you like you're interrupting them from something. And sometimes you'll be the only other human contact that person has had all day. Or you'll help them turn their day around just by making them smile. Or you'll say something offhand that is actually quite profound to them in the moment. Over time you'll get the hang of it. Really all I'm talking about is engaging total strangers...or chatting with acquaintances that seem to need to talk...or just making eye contact and smiling at someone, ferchrissakes. You'll never know if or how you made an impression. And it doesn't matter. Because I promise you, this practice will make you feel more alive and connected. And over time it will turn you into a more accepting, compassionate and kind person who does stuff like this automatically all of the time. This is what is meant by "be the change you want to see in this world." Let the change start with you. I have been doing this for years. It is really wonderful to see someone, who thinks they are invisible to the real world, smile at you because you've smiled at them. It doesn't hurt anyone to be nice. It can only make them feel more special. You don't have to give monetarily to make a difference, either. It's good to see how I feel written in print. Thank you. Hooray! Thanks for your comment. I really think if we could all be more conscious of each other, it would change the world.